Top Dawg Athlete of the Week is a weekly honor given out by the KBRX Sports Department during the Dawg Pound Sports Show every Wednesday night. Student/athletes are considered based on accomplishments from games the previous week before the Show (Mon-Sat). Any high school athlete from our KBRX coverage area is eligible. Once chosen, an athlete will not be eligible for two months, or until the conclusion of the current sports season. Since we cannot cover all sporting events, listeners and fans are encouraged to submit their nominations to us. 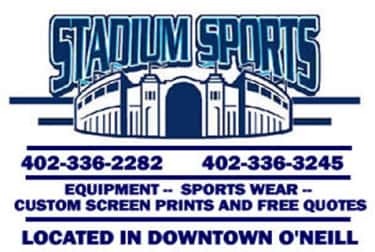 If you have a nomination, please fill in the form at the bottom of the page, send it to us via e-mail to sports@kbrx.com, call us at 402-336-1612, fax it to us at 336-3585 or simply tell a member of the Sports Department. Please include a reason why this athlete is deserving of the honor of Top Dawg, and include any stats or other significant achievements that may apply. Please contact us if you have questions or comments about the Top Dawg Athlete of the Week. Thank you for helping us honor the area athletes who are deserving of recognition for their efforts in representing their schools and communities. *NOTE: If the form below does not work, please try another method of getting in touch with us. With the new website we are still trying to work through some bugs. Thanks for your patience. Put up 52 points, 21 rebounds and 11 assists in four postseason games. He was key in the comeback against Pierce in the district final, and also helped O’Neill in the near-comeback against Scotus with 24 points. Justin was a key cog in a successful O’Neill run at the end of the year. Riley did her part offensively with 59 points, 12 rebounds, 7 assists and 9 steals during the district final and 3 games at State. Riley was the heart of the team defensively, playing the toughest assignment in each game. Was instrumental in the upset of Ainsworth, scoring 13 points and swiping 3 steals. He was also the primary defender on Brady Delimont (only the most prolific 3-point shooter in Nebraska history), holding him in check throughout the game. Won his first state title by going 4-0 at the state tournament in the 182 pound weight class. Notable wins were a semifinal victory over Cade Svoboda (his first loss) and a championship win over Jack Duffy. Bailey also picked up his 100th career win at the tournament. Put up 18 points, 10 rebounds, 6 assists, 2 blocks and a steal against a great Stuart team in subdistrict play, also recording 8 points, 6 rebounds and 2 assists against St. Mary’s during the week. Earned the district championship in a tough D2 District at 145 pounds, recording 2 pins and 1 decision over quality opponents to qualify for the state tournament. Put up 17 points, 10 rebounds and 3 steals against Plainview in a 38-31 Eagle win. Scored 51 points, added 9 rebounds, 9 assists and 6 steals in three games to help lead the Huskies to their first NVC championship. Riley also made the play at the end of the title game, getting the steal and hitting the free throw to seal the one point win. Helped lead the Cardinals to 2nd place in the tough NVC tournament, playing above her averages in almost every category with 64 points, 32 rebounds, 7 steals and 5 blocks in 3 games during the week. In a week’s work, Andy put up 32 points, 28 rebounds, 3 assists, 5 blocked shots and 3 steals against Osmond, 29 points, 10 rebounds, 6 assists, 6 blocked shots and 5 steals vs Elkhorn Valley, and 27 points, 10 rebounds, 4 assists, 6 blocked shots and 1 steal vs Wausa. Put up 28 points in a monster game against the O’Neill Eagles, leading the team to a 59-52 victory. Both boys placed 1st at the Neligh Invite in tough weight classes. Connor won the 113 lb class with decisions over Baasch of Amherst and Martinez of Elkhorn Valley. Both were medalists at State last year. Zac beat his first two opponents by pin in under a minute, then finished up the 120 lb weight class with a pin over EV’s Steward and a decision over State medalist Breuer of Neligh-Oakdale in the championship. Combined, they contributed 42 points to Creighton’s 2nd place finish. Whitney scored 25 points in a comeback win over Osmond, accounting for almost half of the team’s scoring total to add to 6 rebounds, 4 steals and 3 assists. She also led the Cyclones to a 2-0 record on the week with a 10 point, 7 rebound, 4 assist effort against Neligh-Oakdale. After finishing 3rd in every meet to this point, Breydon won the 160 pound weight class at the West Holt Invite and scored 27 points to help the Huskies to a 3rd place finish as a team. The twins led Stuart to huge wins over CWC and EPPJ during the week. Monique had 32 points, 14 rebounds, 9 assists and 3 steals and Jaden added 31 points, 11 rebounds, 6 assists and 6 steals during the two games.